If it’s not the most famous marathon, it surely is the most symbolic of all. 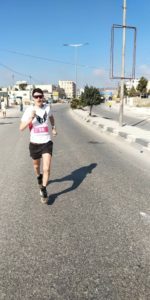 Running the Palestine marathon is a striking experience. 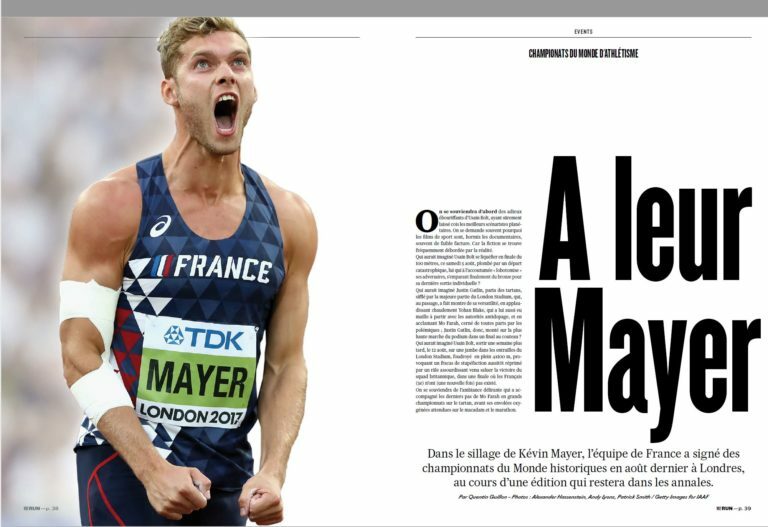 Report (version française ICI). We just reached the third kilometer when the slope suddenly rises. At the top of the climb, we face an impressive stone block. Some barbed wire overhangs it. The lead car turns to the left on a half-sunken road. We follow the wall, whose top height is about eight meters. The wall is full with short portrays. They tell the lives of young Palestinians. They tell simultaneously theirs sufferings and theirs resilience. Further down in the road, the ironic portrait of Donald Trump is alongside Rasan-el-Najjar’s one. The young woman was killed in Gaza last summer by an Israeli sniper. The medic was shot as she was performing medical aid. 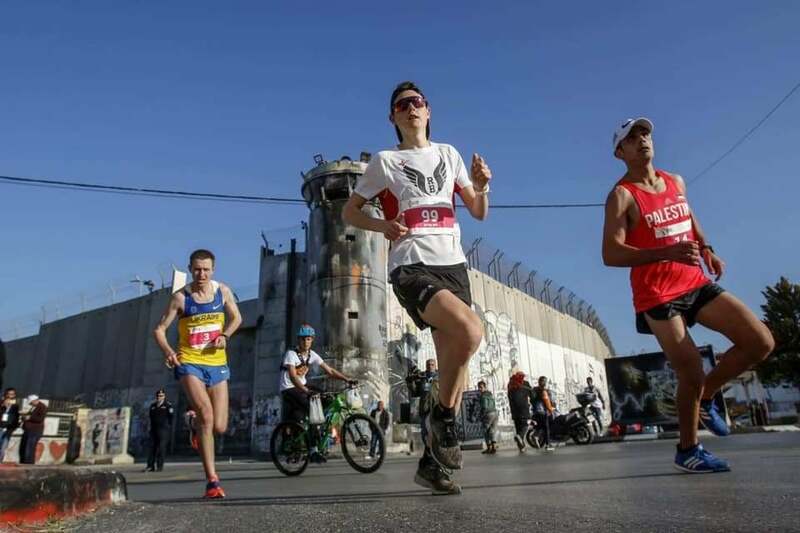 The Palestine marathon isn’t exactly like any other marathon. What is the point of the repeated ground impacts, which bruise the muscles all throughout the race, compared to the repeated shocks endured by the whole population in the occupied territories? Running feels so insignificant. But running is so valued, or appears to be, in the light of the numerous appreciations that we get from the local population, which thank us for having visited the country and having run the marathon. 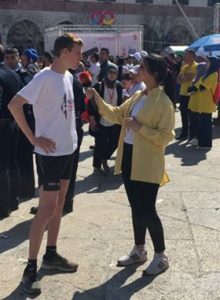 The Palestine marathon was created in 2013. Its purpose was clear: promote the right to movement. What better way than the running to convey that message and to denounce the daily confinement which personalizes in the wall, which is both scary and sad? The wall was built in 2002, when the second Intifada erupted. It reminds the East Side Gallery which tourists can visit in Berlin. Berlin Wall was smashed some 30 years ago. This wall is very much still standing. The lead car slows down and tries to get through the sidewalk and badly parked car. « Yallah ! » (Let’s go) Ahmad Taha claps his hands. 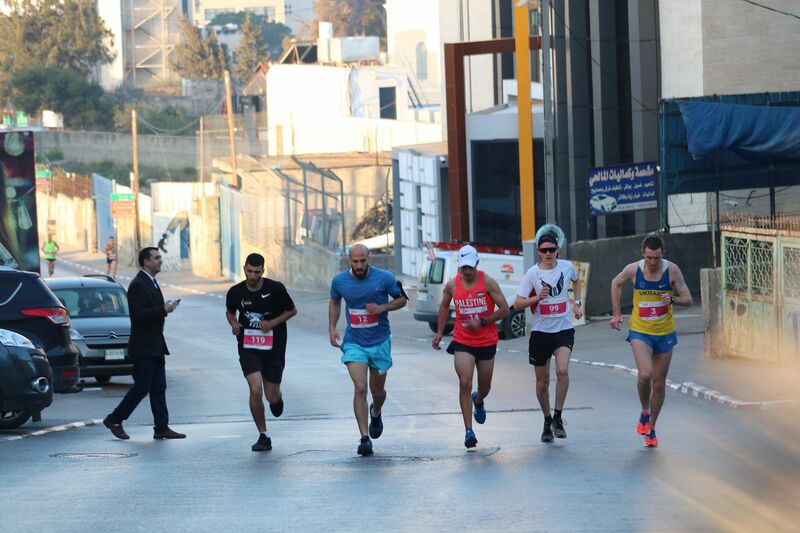 Welcome to the Palestinian Marathon. It’s 6:15 a.m. The race started 15 minutes ago. Last year, the start time was at 8:00 and runners had suffered from the heat. 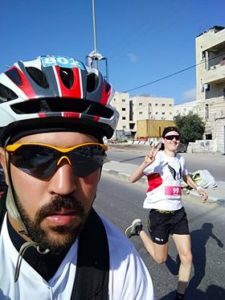 The Palestinian Olympic Committee (POC), who has evicted since 2016 the Right to Movement association which created the marathon, has improved since a year ago. The sun is already high in the sky, and the scenery around the valley is breathtaking. Streets are almost empty. Some heads stick out of a café, on a doorstep, at a traffic light. Some glances tell the incredulity. Who are these people running down the road? Hordes of tourists who get off tour operator buses to visit Bethlehem are asking themselves the same question. A rooster yells on the top of his lungs. 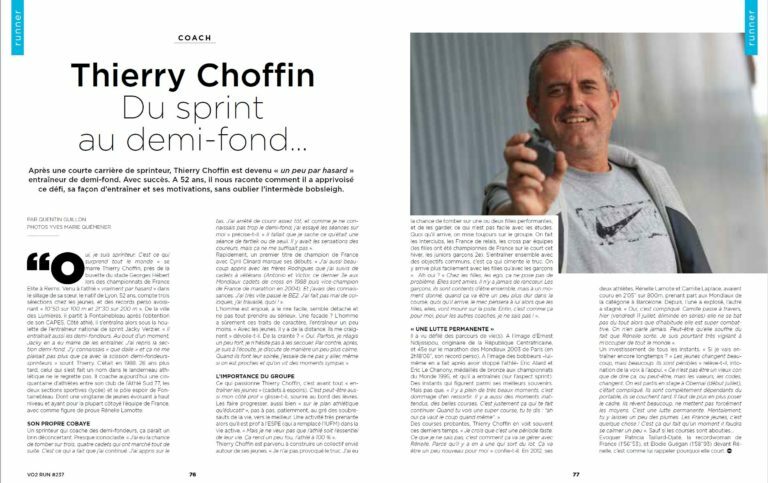 “When I started running six years ago, you could never find anybody doing the same. Actually people used to make fun of me, because it was something really weird to them” Ahmad comments. 10th kilometer. The pace is about 15 kilometers per hour, along with the defending champion Yuriy Blahodir of Ukraine, and Ahmad Tata. The run back to Bethlehem begins. Already? 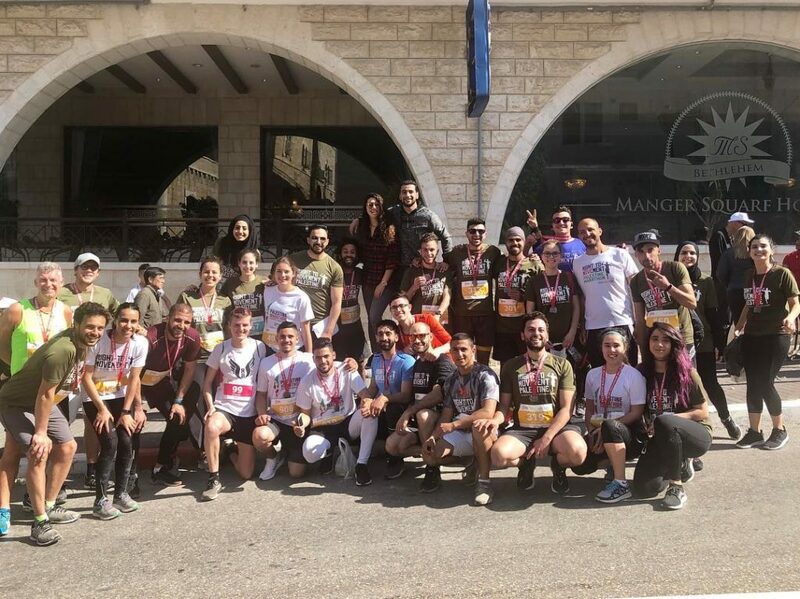 The route is constituted of two loops of 13.1 miles in order to avoid the Israeli checkpoints, which are spread everywhere on the occupied territories. “This shows the struggles of our daily life. We don’t have enough space for running. We are enclosed in a bubble” Amir testifies. Thoughts come into collision. My legs start to be painful –I’m not in good shape, and with Charlie we enjoyed the first days in the area. I hope it won’t end up as in the Medoc Marathon. Luckily, I’m breathing easily. Thoughts come into collision. The day before the marathon, a Palestinian was killed near Bethlehem, by an Israeli soldier. His car was then “bulldozed”. Another Palestinian was seriously wounded. That’s why the marathon could have been cancelled. On Thursday, the day before the race, most shops closed down to protest against this killing. Half-marathon. The lead car hesitates. We turn to the right to climb a tough hill, again. Some shouts. Wrong turn. We turn round, we take back on main road to do the U-turn to start the second loop. There are a few more people on the sidewalks now. Ahmad Taha is wearing a Palestinian tank top, which was tailor-made by his mother. Ahmad is especially supported by the locals. The Ukrainian is on my heels. I feel him. I decide to wait for him. Being exhausted for the rest of the season is pointless. I am also weary of muscle tiredness, even if the legs feel pretty good for now. I look at the Palestinian police who secure the main intersections. They stopped the cars whose aim is to drive on the roads –although some of them manage to do it. Nothing to do, nevertheless, with the checkpoints which punctate the whole of Palestine. “We don’t know each other if Israelis soldiers ask questions” Sofiane* averted us in the long queue of cars waiting for the controls. Ten kilometers remaining. I suddenly ramped up the pace in a long descent. Muscles are screaming, but it should be good. 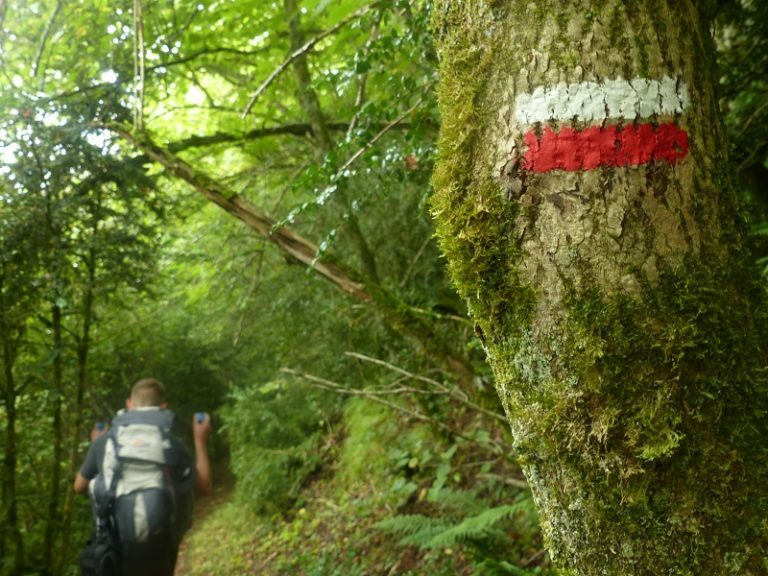 The cardio gets excited and lungs are howling in the following climb. On the same road, without separation, we bump into the other way round half marathon runners (who took the start line 20 minutes after the marathon) who are heading for the descent. Foreign runners cheer for me loudly. I arrive at the U-Turn, at the top of the hill. Descent, again, full gas. I made the gap. I begin discussing with Omar. On his bike, he is opening the race in addition to the lead car. He offers me water and dates every two minutes. He keeps taking selfies. 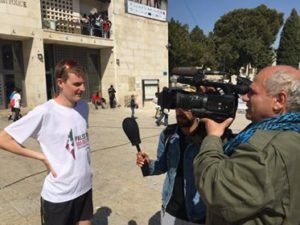 I begin to understand why this marathon is so important for the Palestinians. Omar doesn’t think about his Palestinian ID, which forbids him from going to Jerusalem. He doesn’t think about the temporary permit which he has to request –and which is often not allowed- to go to Jerusalem. He doesn’t think about the other permit he should request to go to Tel Aviv airport to travel abroad –to get this one he should go to… Jerusalem. He doesn’t think about the long hours he has spent to go to Amman in Jordan, the customs check he has to undergo (Palestinian’s, Jordanian’s, Israeli’s), before traveling to Europe, to the USA (provided that he had got a VISA) or anywhere else. He doesn’t think about the wall either, nor of the settlers who had attacked during the week a Palestinian woman in Hebron, city in which the citizens haven’t the same rights. He doesn’t think about the apartheid anymore (1), nor of the roads only the Israeli settlers can use. He’s simply riding his bike. 33rd km. Long straight line on a slight downhill. 200 meters in front of us, a big herd of goats cross the road. An old shepherd, accompanied by his dog, serves as guide. Is a marathon worth such solicitations? 37th. I look back on a straight road. Except half marathon contenders, no Ukrainian yellow jersey in sight. The win is close. I begin to count down the remaining kilometers. 5k left. Thoughts come into collision, albeit tiredness starts to grow. I try to enjoy the moment. A really egoistic thought as my passport, which is just some sheets of paper, allow me to go wherever I want, when I want. Kids on their bikes who are joining us for the marathon’s closing stages don’t have this chance. Nor Omar, whose birth place and nationality forbid him to go in dozens of countries. Last climb, it is steep. Suddenly, Omar is making gestures, shouts. I look back: the Ukrainian guy is clinging on me. How did he manage to come back? No time to look for answers. 50 meters remaining. I forget about the Israeli-Palestinian conflict for a few seconds, as well as the slogan “Make hummus, not walls” which is tagged on the wall. Stimulus-response. Legs accelerate all of a sudden. Slight fright, but I cross the line first. For just one second: 2:42:41. As soon as I get across the finish line, selfies proliferate. Interviews, also. Omar finds me in the wake of the podium. The sun hammers, now. A touch exhaustion, I take a few seconds to recognize him. He’s ecstatic. Yes, the race’s elevation gain peaks to more 500m; yes, I’m not in a very good shape; but does running a marathon worth such solicitations? But Palestinians don’t care about the contingences of the distance running. 2:42:40; 2:10:00; 3:15:00; 1:50:00, it is the same thing, to them. What does matter? They are proud that foreigners came to them. They are proud of having talked about their country. They are proud of having been “tour guides”. We are invited in a small local restaurant. On the menu? Hummus, pita, shawarma, (delicious) knafeh for the dessert. Hard to do better. On the way back to Ramallah, at about 30km, as the crow flies, an Israeli army jeep broke down. The army closed the main road waiting for the mechanic. Detour. Heavy traffic jam. The driver of the collective taxi –the main conveyance in Palestine, we’re seven inside- suggests us to take another detour, against five extra shekels a head. Obviously the distance is longer, but instead of the two hours remaining, he thinks it would take one and a half to arrive in Ramallah. Grotesque situation. We’re glancing at each other. The five other speak English. We’re tearing a scrap of paper in seven pieces. Ballot. We’re laughing. Nevertheless we hadn’t been fast enough. The driver has opted for the second option, the long but fast drive. “Democracy has been killed!” we laugh. We are less than five minutes away from the Ramallah main taxi station when we hear gun shots. A few meters away from us, a dozen of Palestinians, small stones in their hands, are facing five soldiers, rifle over their shoulder, standing a few meters from them. “Clashes” say the occupants, unconcerned by what’s going on. Not much still affects them, actually. “From now on, I don’t feel anything when I see videos of Nice’s attack, or Christchurch’s attack. I have the same feeling in front of the wall: I don’t feel anything” Tarik* whispers. Murders are their daily life. Such as the killing of Sajed Mizhe, 17. He was volunteer first responder on the marathon and he was killed five days later in Deheisha refugee camp, which the race went through, as he was helping some wounded Palestinians. The checkpoint at the gateway of Ramallah is closed. The taxi parks a little bit further. He calls one of his colleague. “What path could I take?” Intricacies in small villages. Outcome? More than two hours to join the two towns. (1) Two years ago an U.N. agency published a report accusing Israel of imposing an “apartheid regime”. Report is to be read here. Next PostAffaire Clémence Calvin : comment raconter l’exploit sportif quand le doute émerge ?